January – Page 6 – every day's a holiday! Despite these persuasive efforts, many of the Vikings were reluctant to renounce their Gods and accept Jesus as their savior. New and increasingly painful tortures and executions were devised by King Olaf and his men. The seer Thorlief had his eye torn out. Eyvind Kinnrifi was tortured with a brazier of hot coals on his stomach. Other pagans were beheaded with an axe, mutilated, drown, or burned alive along with their residences. But the most innovative torture developed was reserved for a landowner, leader-priest and sea-farer known as Raud the Strong. Raud the Strong was known for his beautiful longship, a boat larger than any of the King’s, with a dragon’s head crafted into the bow. 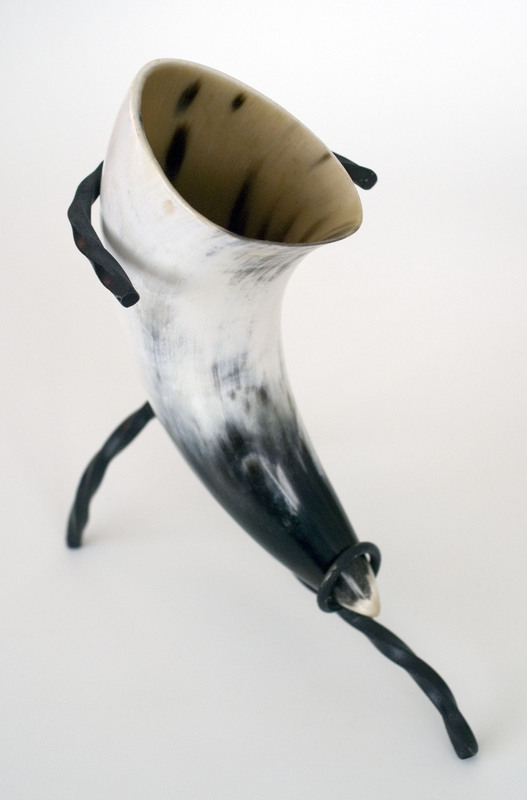 When Raud the Strong refused to renounce Thor and Odin, King Olaf’s men inserted a poisonous snake into a long metal horn. The horn was then rammed down Raud’s throat and the end of it was heated with a flame, forcing the snake to wriggle down Raud’s esophagus. Touched by fire, they forced to glide. Raud the Strong blaspheming died. Up the streams of Salten Fiord. 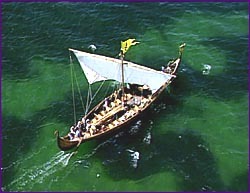 After Raud’s death King Olaf seized Raud’s beautiful ship, and supposedly copied the design. According to legend this is how the famous Viking ships got their distinct shape. How Asatru’s observe Raud the Strong Day, I don’t know. But it is not by shoving horns with snakes down Christians’ throats. Today is the birthday of the King of Rock ‘n’ Roll Elvis Presley. 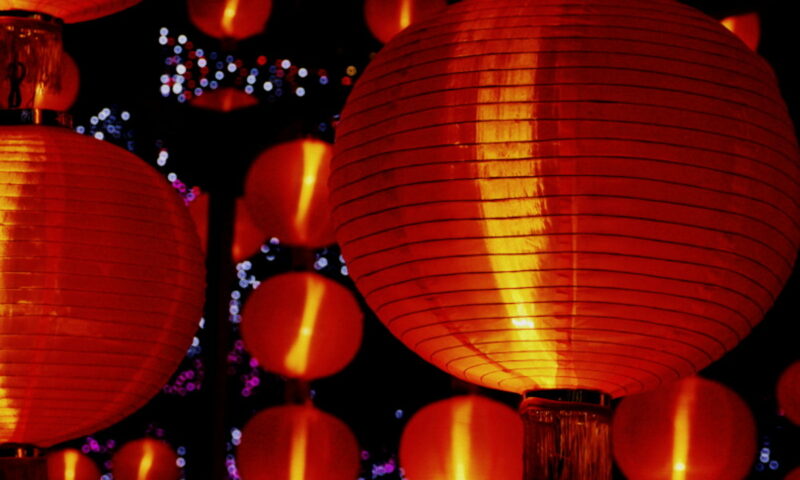 Though not an official holiday in any nation, it is observed throughout the world. 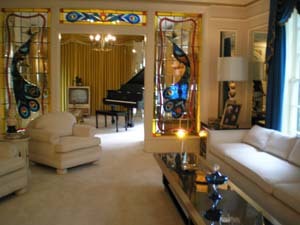 The focal point of the celebration is Graceland, Elvis’s former home in Memphis, Tennessee. Festivities begin each year with a gospel tribute at the Gates of Graceland at midnight. Graceland was not named by Elvis, but by the original owner S.E. Toof after his daughter Grace. Elvis Presley was born in Tupelo, Mississippi. 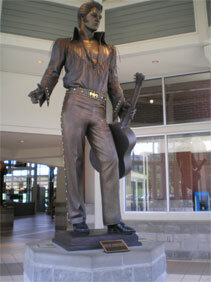 At age 13 the Presley family moved to Memphis, Tennessee, where Elvis lived for most of his life. In 1957 the 22 year-old superstar purchased the Graceland mansion in Memphis. He was proud to move his parents into it, a long way from the two-room house where Elvis was raised. His mother Gladys died the following year. Early viewers of Elvis’s concerts, such as rock legend Roy Orbison, cite his instinct and incredible energy as a performer as separating him from the artists before him. It is difficult to convey the novelty of Elvis after the half-century of imitations and changes that followed. 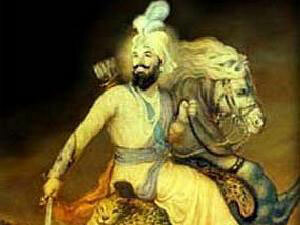 Various morality groups assailed him for his “vulgar” and “obscene” music and movements on stage. While this was true in mainstream radio, Elvis was heavily influenced by the black gospel singers he had seen at Memphis’ Ellis Auditorium and black blues performers in the clubs along Beale Street. Stories make it sound like Elvis walked into Sun Studios and the rest is history, but in fact, after his first recording in 1953, Elvis politely hassled Sam Phillips for a year—while working as a truck driver—before Sam teamed him up with bassist Bill Black and guitarist Scotty Moore. The three recorded a high-energy version of black R&B artist Arthur Crudup’s “That’s All Right, Mama” in July and the single was released that month. Some white disc jockeys refused to play Elvis’ music at first, believing Elvis was black. Heartbreak Hotel slowly and steadily climbed the charts, entering at #1 68 in March, and making its way to #1 in May. Though Graceland is considered the musical Mecca for Elvis fans, do not miss Sun Studios just to the east on Union Avenue, for a more in-depth historically revealing tour about Elvis and Memphis music history. First, what kind of sicko sends their true love sends 23 birds, 50 assorted pipers, drummers, milk maids, ladies and leapin’ lords, five rings and a pear tree, and doesn’t include one vacuum? Actually December 25th is the first day of Christmas, not the last. In the modern world of Christmas so much energy is focused on preparing exclusively for the first day that by the time the 26th rolls around many people are simply Christmas’d out. Today we tend to mark our holidays by calendar day–midnight to midnight–but these holidays were traditionally celebrated sunset to sunset. The famed “Twelfth Night” actually falls on the evening of January 5th, though calendars mark the Epiphany as January 6th. The Epiphany literally means ‘manifestation’ and marks the day the Three Wise Men, or Magi, encountered the Virgin Mary and the Baby Jesus. The three differing places of origin may have developed as a way of demonstrating the diversity of Christ’s influence. One theory for their origin is that they were Zoroastrians. Zoroastrianism was one of the most common religions of Persia at the time, and its priests were astrologers, who were revered for their knowledge of the night sky. Over the next two millennia many European traditions associated with the winter solstice merged with the twelve days of Christmas. For example, on Twelfth Night roles were often reversed, such as master and servant, a tradition stemming from the Roman Saturnalia. So enjoy this the twelfth and last day of Christmas. 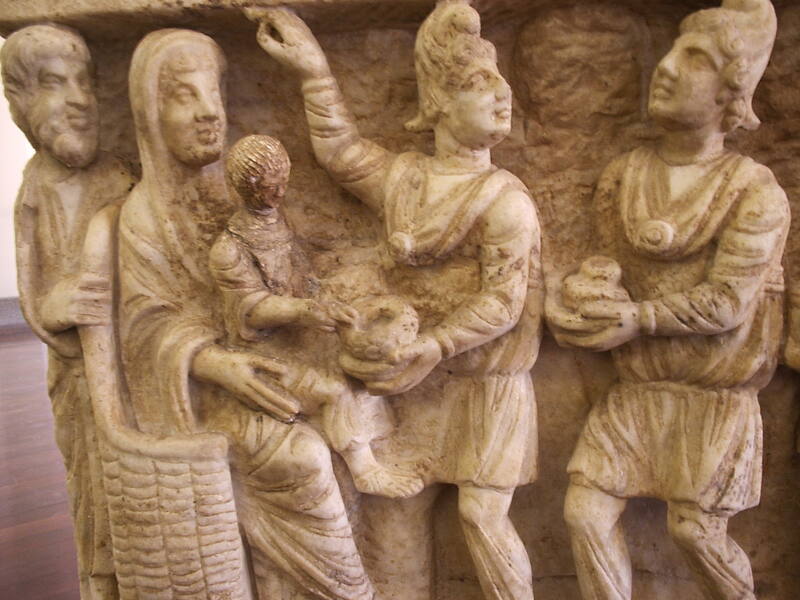 And whatever you do, don’t give a baby myrrh. That’s just rude. The people of Myanmar–formerly Burma–are in a difficult spot while celebrating January 4, the anniversary of their independence. The public secretly reveres the country’s national hero, but cannot utter his name outdoors. The main force behind Burma’s independence was Aung San. During World War II Aung San was Commander of the Burma Defense Army. He opposed British rule in Burma and saw an alliance with Japan as the way to independence. However, San soon saw that the thin veneer of independence achieved from the British was a sham. For the nation was now under the thumb of the more-controlling Japanese. 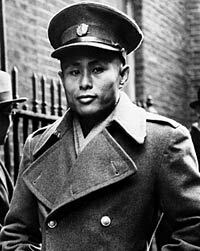 Aung San founded the Anti-Fascist Organization in Burma, and led the Burma National Army with the help of the British against the Japanese, whom they ultimately defeated. In 1947 Aung San negotiated the “Aung San-Attlee Agreement” with the British, which guaranteed Burma’s independence the following year. Aung San would not live to see the free Burma. He was assassinated along with six other Councillors at an Executive Council meeting in July 1947. He was 32. Aung San’s daughter, Aung San Suu Kyi, is and has been for twenty years, an outspoken critic of the current Burmese (Myanmar) government. She returned to Burma to care for her mother who was gravely ill at the time. A month before her visit in 1988, riot police shot and killed 200 demonstrators, mostly students. In August they killed close to 3,000. I could not, as my father’s daughter, remain indifferent to all that is going on. Martial law was declared in 1989. Ang San Suu Kyi became head of the opposition party, the National League for Democracy. Due to her rising popularity she was placed under house arrest. She would not see her children in 2 1/2 years. Aung San Suu Kyi should have taken office when her party won the national election in 1990. However, surprised by their overwhelming loss, the military junta refused to acknowledge the election. In 1991 Aung San Suu Kyi won the Nobel Peace Prize while under house arrest. When she was released in 1995, she was told if she left the country she could not return. Thus she did not leave even when her husband in London was diagnosed with prostate cancer in 1997. She never saw him again. He died in 1999. She was placed under house arrest again in 2000, where she has remained for most of the past decade. Whether Aung San Suu Kyi will, unlike her father, live to see the promise land, a democratic Burma, remains to be seen. She still fervently clings to a non-violent approach to regime change, despite knowing that peaceful change may take longer. She believes it is a precedent that must be set. Update: Aung San Suu Kyi was released from house arrest on November 13, 2010. 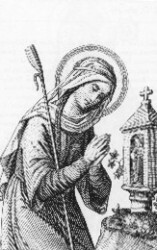 Today is St. Genevieve’s feast day. She’s honored as the Patron Saint of Paris. St. Genevieve became a nun at the tender age of 15 and devoted the rest of her life—another 65 years—to Christ. The secret of her longevity may have been her diet. She didn’t eat much more than barley bread and beans, and according to her biography, only twice a week, Sundays and Thursdays. She loosened this restriction at the age of 50 at the request of some bishops. The following decade, during the lengthy Childeric siege on the city, Genevieve sneaked through a blockade to bring back much-needed grain to Paris’s starving citizens. Death did not stop Genevieve from performing miracles. Parisians held a procession of her relics during the deadly plague of 1129 which killed 14,000 people. Spread of the disease ceased almost immediately, and many who were sick were reported to have healed upon touching her relics. St. Genevieve’s saint day is January 3, but for centuries Parisians celebrated the anniversary of that first procession–November 26, 1129–with another procession in her honor. We made it to day 2 of the new year and the Swiss are already celebrating their second holiday. Berchold’s Day, January 2, is named after Duke Berchtold V of Zahringen who founded the capital city of Switzerland in 1191. 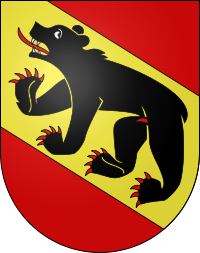 St. Brechtold’s Day is celebrated mostly in the area around Berne. Though the confederacy of Switzerland is 700 years old, each region has maintained their own culture and identity. Switzerland’s central location in Western Europe makes it the “melting pot” of very white people: French, German, Italian, and Swiss. So I guess it’s more of an assorted cheese wheel of cultures, since it hasn’t really melted yet. …the second day of January is devoted to gay neighborhood parties in which nuts play an important part. You know, I’m not even going to quote you the rest of that. Hocks are made up of five nuts—a pyramid with four nuts on the bottom and one on top—and apparently they’re harder to construct than you’d think. We don’t know why nuts are involved. Officeholidays.com theorizes that Berchtold really killed a squirrel. We stack nuts in your honor.